In this transcribed interview with Amy Goodman of Democracy Now!, Noam Chomsky discusses the light shed on World Affairs by the leak of US diplomatic cables via wikileaks in November 2010, along with his role in the leak of the Pentagon Papers in 1971. AMY GOODMAN: ... We have lost David Leigh, investigations editor from The Guardian. He was speaking to us from the busy newsroom there. The Guardian is doing an ongoing series of pieces and exposes on these documents. They are being released slowly by the various news organizations, from The Guardian in London, to Der Spiegel in Germany, to El Pais in Spain, to the New York Times here in the United States.. For reaction to the WikiLeaks documents, we're joined by world renowned political dissident and linguist Noam Chomsky, Professor Emeritus at Massachusetts Institute of Technology, author of over a hundred books including his latest Hopes and Prospects. Forty years ago, Noam and Howard Zinn helped government whistleblower Daniel Ellsberg edit and release the Pentagon Papers that top-secret internal U.S. history of the Vietnam War. Noam Chomsky joins us from Boston. It is good to have you back again, Noam. Why don't we start there. Before we talk about WikiLeaks, what was your involvement in the Pentagon Papers? I don't think most people know about this. NOAM CHOMSKY: Dan and I were friends. Tony Russo, who also who prepared them and helped leak them. I got advanced copies from Dan and Tony and there were several people who were releasing them to the press. I was one of them. Then I -- along with Howard Zinn as you mentioned -- edited a volume of essays and indexed the papers. AMY GOODMAN: So explain how, though, how it worked. I always think this is important -- to tell this story -- especially for young people. Dan Ellsberg -- Pentagon official, top-secret clearance -- gets this U.S. involvement in Vietnam history out of his safe, he Xerox's it and then how did you get your hands on it? He just directly gave it to you? NOAM CHOMSKY: From Dan Ellsberg and Tony Russo, who had done the Xeroxing and the preparation of the material. AMY GOODMAN: How much did you edit? NOAM CHOMSKY: Well, we did not modify anything. The papers were not edited. They were in their original form. What Howard Zinn and I did was -- they came out in four volumes -- we prepared a fifth volume, which was critical essays by many scholars on the papers, what they mean, the significance and so on. And an index, which is almost indispensable for using them seriously. That's the fifth volume in the Beacon Press series. AMY GOODMAN: So you were then one of the first people to see the Pentagon Papers? NOAM CHOMSKY: Outside of Dan Ellsberg and Tony Russo, yes. I mean, there were some journalists who may have seen them, I am not sure. AMY GOODMAN: What are your thoughts today? For example, we just played this clip of New York republican congress member Peter King who says WikiLeaks should be declared a foreign terrorist organization. NOAM CHOMSKY: I think that is outlandish. We should understand -- and the Pentagon Papers is another case in point -- that one of the major reasons for government secrecy is to protect the government from its own population. In the Pentagon Papers, for example, there was one volume -- the negotiations volume -- which might have had a bearing on ongoing activities and Daniel Ellsberg withheld that. That came out a little bit later. If you look at the papers themselves, there are things Americans should have known that others did not want them to know. And as far as I can tell, from what I've seen here, pretty much the same is true. In fact, the current leaks are -- what I've seen, at least -- primarily interesting because of what they tell us about how the diplomatic service works. HILARY CLINTON: I think that it should not be a surprise to anyone that Iran is a source of great concern, not only in the United States. What comes through in every meeting that I have -- anywhere in the world -- is a concern about Iranian actions and intentions. So, if anything, any of the comments that are being reported on allegedly from the cables confirm the fact that Iran poses a very serious threat in the eyes of many of her neighbors and a serious concern far beyond her region. That is why the international community came together to pass the strongest possible sanctions against Iran. It did not happen because the United States said, "Please, do this for us!" It happened because countries -- once they evaluated the evidence concerning Iran's actions and intentions -- reached the same conclusion that the United States reached: that we must do whatever we can to muster the international community to take action to prevent Iran from becoming a nuclear weapons state. So if anyone reading the stories about these, uh, alleged cables thinks carefully what they will conclude is that the concern about Iran is well founded, widely shared, and will continue to be at the source of the policy that we pursue with like-minded nations to try to prevent Iran from acquiring nuclear weapons. AMY GOODMAN: That was Secretary to Hillary Clinton yesterday at a news conference. I wanted to get your comment on Clinton, Netanyahu's comment, and the fact that Abdullah of Saudi Arabia -- the King who is now getting back surgery in the New York -- called for the U.S. to attack Iran. Noam Chomsky? NOAM CHOMSKY: That essentially reinforces what I said before, that the main significance of the cables that are being released so far is what they tell us about Western leadership. So Hillary Clinton and Benjamin Netanyahu surely know of the careful polls of Arab public opinion. The Brookings Institute just a few months ago released extensive polls of what Arabs think about Iran. The results are rather striking. They show the Arab opinion holds that the major threat in the region is Israel -- that's 80. The second major threat is the United States -- that's 77. Iran is listed as a threat by 10%. With regard to nuclear weapons, rather remarkably, a majority -- in fact, 57Ðsay that the region would have a positive effect in the region if Iran had nuclear weapons. Now, these are not small numbers. 80, 77, say the U.S. and Israel are the major threat. 10 say Iran is the major threat. This may not be reported in the newspapers here -- it is in England -- but it's certainly familiar to the Israeli and U.S. governments, and to the ambassadors. But there is not a word about it anywhere. What that reveals is the profound hatred for democracy on the part of our political leadership and the Israeli political leadership. These things aren't even to be mentioned. This seeps its way all through the diplomatic service. The cables to not have any indication of that. When they talk about Arabs, they mean the Arab dictators, not the population, which is overwhelmingly opposed to the conclusions that the analysts here -- Clinton and the media -- have drawn. There's also a minor problem; that's the major problem. The minor problem is that we don't know from the cables what the Arab leaders think and say. We know what was selected from the range of what they say. So there is a filtering process. We don't know how much it distorts the information. But there is no question that what is a radical distortion is -- or, not even a distortion, a reflectionÐof the concern that the dictators are what matter. The population does not matter, even if it's overwhelmingly opposed to U.S. policy. There are similar things elsewhere, such as keeping to this region. One of the most interesting cables was a cable from the U.S. ambassador in Israel to Hillary Clinton, which described the attack on Gaza -- which we should call the U.S./Israeli attack on Gaza -- December 2008. It states correctly there had been a truce. It does not add that during the truce -- which was really not observed by Israel -- but during the truce, Hamas scrupulously observed it according to the Israeli government, not a single rocket was fired. That's an omission. But then comes a straight line: it says that in December 2008, Hamas renewed rocket firing and therefore Israel had to attack in self-defense. Now, the ambassador surely is aware that there must be somebody in the American Embassy who reads the Israeli press -- the mainstream Israeli press -- in which case the embassy is surely aware that it is exactly the opposite: Hamas was calling for a renewal of the cease-fire. Israel considered the offer and rejected it, preferring to bomb rather than have security. Also omitted is that while Israel never observed the cease-fire -- it maintained the siege in violation of the truce agreement -- on November 4, the U.S. election 2008, the Israeli army invaded Gaza, killed half a dozen Hamas militants, which did lead to an exchange of fire in which all the casualties, as usual, were Palestinian. Then in December, Hamas -- when the truce officially ended -- Hamas called for renewing it. Israel refused, and the U.S. and Israel chose to launch the war. What the embassy reported is a gross falsification and a very significant one since -- since it has to do the justification for the murderous attack -- which means either the embassy hasn't a clue to what is going on or else they're lying outright. AMY GOODMAN: And the latest report that just came out -- from Oxfam, from Amnesty International, and other groups -- about the effects of the siege on Gaza? What's happening right now? NOAM CHOMSKY: A siege is an act of war. If anyone insists on that, it is Israel. Israel launched two wars -- '56 and '67 -- in part on grounds its access to the outside world was very partially restricted. That very partial siege they considered an act of war and justification for -- well, one of several justifications -- for what they called "preventive" -- or if you like, preemptive -- war. So they understand that perfectly well and the point is correct. The siege is a criminal act, in the first place. The Security Council has called on Israel to lift it, and others have. It's designed to -- as Israeli officials have have stated -- to keep the people of Gaza to minimal level of existence. They do not want to kill them all off because that would not look good in international opinion. As they put it, "to keep them on a diet." This justification, this began very shortly after the official Israeli withdrawal. There was an election in January 2006 after the only free election in the Arab world -- carefully monitored, recognized to be free -- but it had a flaw. The wrong people won. Namely Hamas, which the U.S. did not want it and Israel did not want. Instantly, within days, the U.S. and Israel instituted harsh measures to punish the people of Gaza for voting the wrong way in a free election. The next step was that they -- the U.S. and Israel -- sought to, along with the Palestinian Authority, try to carry out a military coup in Gaza to overthrow the elected government. This failed -- Hamas beat back the coup attempt. That was July 2007. At that point, the siege got much harsher. In between come in many acts of violence, shellings, invasions and so on and so forth. But basically, Israel claims that when the truce was established in the summer 2008, Israel's reason for not observing it and withdrawing the siege was that there was an Israeli soldier -- Gilad Shalit -- who was captured at the border. International commentary regards this as a terrible crime. Well, whatever you think about it, capturing a soldier of an attacking army -- and the army was attacking Gaza -- capturing a soldier of an attacking army isn't anywhere near the level of the crime of kidnapping civilians. Just one day before the capture of Gilad Shalit at the border, Israeli troops had entered Gaza, kidnapped two civilians -- the Muammar Brothers -- and spirited them across the border. They've disappeared somewhere in Israel's prison system, which is where hundreds, maybe a thousand or so people are sometimes there for years without charges. There are also secret prisons. We don't know what happens there. This alone is a far worse crime than the kidnapping of Shalit. In fact, you could argue there was a reason why was barely covered: Israel has been doing this for years, in fact, decades. Kidnapping, capturing people, hijacking ships, killing people, bringing them to Israel sometimes as hostages for many years. So this is regular practice; Israel can do what it likes. But the reaction here and the rest of the world of regarding the Shalit kidnapping -- well, not kidnapping, you don't kidnap soldiers -- the capture of a soldier as an unspeakable crime, justification for maintaining and murders siege... that's disgraceful. AMY GOODMAN: Noam, so you have Amnesty International, Oxfam, Save the Children, and eighteen other aide groups calling on Israel to unconditionally lift the blockade of Gaza. And you have in the WikiLeaks release a U.S. diplomatic cable -- provided to The Guardian by WikiLeaks -- laying out, "National human intelligence collection directive: Asking U.S. personnel to obtain details of travel plans such as routes and vehicles used by Palestinian Authority leaders and Hamas members." The cable demands, "Biographical, financial, by metric information on key PA and Hamas leaders and representatives to include the Young Guard inside Gaza, the West Bank, and outside," it says. NOAM CHOMSKY: That should not come as much of a surprise. Contrary to the image that is portrayed here, the United States is not an honest broker. It is a participant, a direct and crucial participant, in Israeli crimes, both in the West Bank and in Gaza. The attack in Gaza was a clear case in point: they used American weapons, the U.S. blocked cease-fire efforts, they gave diplomatic support. The same is true of the daily ongoing crimes in the West Bank, and we should not forget that. Actually, in Area C -- the area of the West Bank that Israel controls -- conditions for Palestinians have been reported by Save The Children to be worse than in Gaza. Again, this all takes place on the basis of crucial, decisive, U.S., military, diplomatic, economic support; and also ideological support -- meaning, distorting the situation, as is done again dramatically in the cables. The siege itself is simply criminal. It is not only blocking desperately needed aid from coming in, it also drives Palestinians away from the border. Gaza is a small place, heavily and densely overcrowded. And Israeli fire and attacks drive Palestinians away from the Arab land on the border, and also drive fisherman in from Gaza into territorial waters. They compelled by Israeli gunboats -- all illegal, of course -- to fish right near the shore where fishing is almost impossible because Israel has destroyed the power systems and sewage systems and the contamination is terrible. This is just a stranglehold to punish people for being there and for insisting on voting the wrong way. Israel decided, "We don't want this anymore. Let's just get rid of them." We should also remember, the U.S./Israeli policy -- since Oslo, since the early 1990's -- has been to separate Gaza from the West Bank. That is in straight violation of the Oslo agreements, but it has been carried out systematically, and it has a big effect. It means almost half the Palestinian population would be cut off from any possible political arrangement that would be made. It also means Palestine loses its access to the outside world -- Gaza should have and can have airports and seaports. Right now, Israel has taken over about 40% of the West Bank. Obama's latest offers have granted even more, and they're certainly planning to take more. What is left is just canonized. It's what the planner, Ariel Sharon called Bantustans. And they're in prison, too, as Israel takes over the Jordan Valley and drives Palestinians out. So these are all crimes of a piece. The Gaza siege is particularly grotesque because of the conditions under which people are forced to live. I mean, if a young person in Gaza -- student in Gaza, let's say -- wants to study in a West Bank university, they can't do it. If it a person in Gaza needs advanced medical training or treatment from an East Jerusalem hospital where the training is available, they can't go! Medicines are held back. It is a scandalous crime, all around. AMY GOODMAN: What do you think the United States should do in this case? 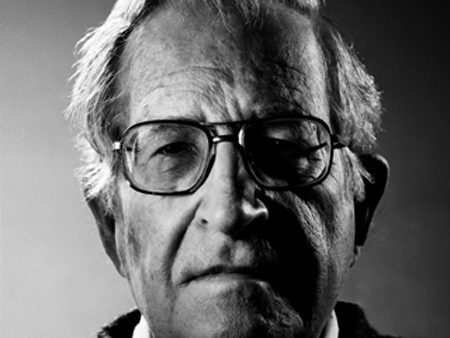 NOAM CHOMSKY: What the United States should do is very simple: it should join the world. I mean, there are negotiations going on, supposedly. As they are presented here, the standard picture is that the U.S. is an honest broker trying to bring together two recalcitrant opponents -- Israel and Palestinian Authority. That's just a charade. If there were serious negotiations, they would be organized by some neutral party and the U.S. and Israel would be on one side and the world would be on the other side. And that is not an exaggeration. It should not be a secret that there has long been an overwhelming international consensus on a diplomatic, political solution. Everyone knows the basic outlines; some of the details you can argue about. It includes everyone except the United States and Israel. The U.S. has been blocking it for 35 years with occasional departures -- brief ones. It includes the Arab League. It includes the Organization of Islamic States. which happens to include Iran. It includes every relevant actor except the United States and Israel, the two rejectionist states. So if there were to be negotiations that were serious, that's the way they would be organized. The actual negotiations barely reach the level of comedy. The issue that's being debated is a footnote, a minor footnote: expansion of settlements. Of course it's illegal. In fact, everything Israel is doing in the West Bank and Gaza is illegal. That hasn't even been controversial since 1967. AMY GOODMAN: We're going to come back to this in a minute. Noam Chomsky, author and institute professor emeritus at MIT, as we talk about WikiLeaks and the state of the world today. AMY GOODMAN: Our guest is Noam Chomsky, world-renowned dissident, author of more than 100 books, speaking to us from Boston. Noam, you wrote a piece after the midterm elections called Outrage Misguided. I want to read for you now what Sarah Palin tweeted Ð the former Alaskan governor, of course, and Republication vice presidential nominee. This is what she tweeted about WikiLeaks. Rather, she put it on Facebook. She said, "First and foremost, what steps were taken to stop WikiLeaks' director Julian Assange from distributing this highly-sensitive classified material, especially after he had already published material not once but twice in the previous months? Assange is not a journalist any more than the editor of the Al Qaeda's new English-language magazine Inspire, is a journalist. He is an anti-American operative with blood on his hands. His past posting of classified documents revealed the identity of more than 100 Afghan sources to the Taliban. Why was he not pursued with the same urgency we pursue Al Qaeda and Taliban leaders?" Noam Chomsky, your response? NOAM CHOMSKY: That's pretty much what I would expect Sarah Palin to say. I don't know how much she understands, but I think we should pay attention to what we learn from the leaks. What we learned, for example, is kinds of things I've said. Perhaps the most dramatic revelation, or mention, is the bitter hatred of democracy that is revealed both by the U.S. Government -- Hillary Clinton, others -- and also by the diplomatic service. To tell the world, well, they're talking to each other -- to pretend to each other that the Arab world regards Iran as the major threat and wants the U.S. to bomb Iran, is extremely revealing, when they know that approximately 80% of Arab opinion regards the U.S. and Israel as the major threat, 10% regard Iran as the major threat, and a majority, 57%, think the region would be better off with Iranian nuclear weapons as a kind of deterrent. That is does not even enter. All that enters is what they claim has been said by Arab dictators Ð brutal Arab dictators. That is what counts. How representative this is of what they say, we don't know, because we do not know what the filtering is. But that's a minor point. But the major point is that the population is irrelevant. All that matters is the opinions of the dictators that we support. If they were to back us, that is the Arab world. That is a very revealing picture of the mentality of U.S. political leadership and, presumably, the lead opinion, judging by the commentary that's appeared here, that's the way it has been presented in the press as well. It does not matter with the Arabs believe. AMY GOODMAN: Your piece, Outrage Misguided. Back to the midterm elections and what we're going to see now. Can you talk about the tea party movement? NOAM CHOMSKY: The Tea Party movement itself is, maybe 15% or 20% of the electorate. It's relatively affluent, white, nativist, you know, it has rather traditional nativist streaks to it. But what is much more important, I think, is the outrage. Over half the population says they more or less supported it, or support its message. What people are thinking is extremely interesting. I mean, overwhelmingly polls reveal that people are extremely bitter, angry, hostile, opposed to everything. The primary cause undoubtedly is the economic disaster. It's not just the financial catastrophe, it's an economic disaster. I mean, in the manufacturing industry, for example, unemployment levels are at the level of the Great Depression. And unlike the Great Depression, those jobs are not coming back. U.S. owners and managers have long ago made the decision that they can make more profit with complicated financial deals than by production. So finance Ð this goes back to the 1970s, mainly Reagan escalated it, and onward -- Clinton, too. The economy has been financialized. Financial institutions have grown enormously in their share of corporate profits. It may be something like a third, or something like that today. At the same time, correspondingly, production has been exported. So you buy some electronic device from China. China is an assembly plant for a Northeast Asian production center. The parts and components come from the more advanced countries Ð and from the United States, and the technology . So yes, that's a cheap place to assemble things and sell them back here. Rather similar in Mexico, now Vietnam, and so on. That is the way to make profits. It destroys the society here, but that's not the concern of the ownership class and the managerial class. Their concern is profit. That is what drives the economy. The rest of it is a fallout. People are extremely bitter about it, but don't seem to understand it. So the same people who are a majority, who say that Wall Street is to blame for the current crisis, are voting Republican. Both parties are deep in the pockets of Wall Street, but the Republicans much more so than the Democrats. The same is true on issue after issue. The antagonism to everyone is extremely high - the population doesn't like Democrats, but they hate Republicans even more. They're against big business. They're against government. They're against Congress. They're against science. AMY GOODMAN: Noam, we only have thirty seconds. I wanted ask if you were President Obama's top adviser, what would you tell him to do right now? NOAM CHOMSKY: I would tell him to do what FDR did when big business was opposed to him. Help organize, stimulate public opposition and put through a serious populist program, which can be done. Stimulate the economy. Don't give away everything to financiers. Push through real health reform. The health reform that was pushed through may be a slight improvement but it leaves some major problems untouched. If you're worried about the deficit, pay attention to the fact that it is almost all attributable to military spending and this totally dysfunctional health program. AMY GOODMAN: Noam, you were continuing your prescription -- your advice that you would give to President Obama today. NOAM CHOMSKY: Well, the economy is a disaster. There is 10% official unemployment, probably twice that much actual unemployment. Many people unemployed for yearsÐthis is a huge human tragedy, but it's also an economic tragedy. These are unused resources which could be producing to make the things that this country needs. The United States is becoming kind of a third world country. The other day, I took a train from Boston to New York -- that's the star of the Amtrak train system. It took about, maybe twenty minutes less than the train that my wife and I took sixty years ago from Boston to New York. In any European country, or really any industrial country it would have taken half the time. Plenty of non-industrial countries, too -- Spain is not a super-rich country, it's just introducing a 200-mile-an-hour railway. This is just one example. The United States desperately needs many things: decent infrastructure, a decent educational system, much more pay and support for teachers, all kinds of things. And the policies that are being carried out are designed to enrich primarily financial institutions; and remember that many of the major corporations like, say, GE and GM are also financial institutions, that is a large part of their activities. It's very unclear that these financial institutions do anything for the economy. Some economists here -- mainstream ones -- are finally beginning to raise this question. They may harm it, in fact. What they do is enrich rich people, and that's where policies are directed to. An alternative would be to stimulate the economy. The demand is very low -- those corporations have money coming out of their ears, they've got huge profits. But they don't want to spend it, they don't want to invest it. They would rather profit from it. Financial institutions don't produce anything, they just shift money around and make money from various deals. The public has some consumer demands, but it's very slight. We have to remember that there was an $8 trillion housing bubble that burst, destroying the assets for most people. Now they're desperately trying to keep a little to save themselves. The only source of demand right now would be government spending. It doesn't even have to affect the deficit -- it can be carried out by borrowing by the FED which sends interest right back to the Treasury -- if anyone cares about the deficit, which is actually a minor issue, I think. That should be the major issue. There should be massive infrastructure spending, there should be spending on simple things like weatherization. We should have a substantial program to reduce the very severe threat of global warming. But that's unfortunately unlikely with the new Republican legislatures and with the effects of the massive corporate propaganda to try to convince people that it's a liberal hoax. The latest polls show that about a third of Americans believe in anthropogenic global warming -- you know, human contributions to global warming. That's almost a death knell for the species. If the U.S. doesn't do anything, nobody else will. AMY GOODMAN: What do you think of the global climate change summit that's taking place in Cancun. NOAM CHOMSKY: Well, the Copenhagen Summit was a disaster -- nothing happened. This one in Cancun has set it's sights much lower in the hope of at least achieving something. But let's say they achieve all their goals, which is very unlikely, it'll still be a toothpick on a mountain. There are much more serious problems behind it. We're now facing a situation where the relevant House committees -- science, technology, and so on -- are being taken over by climate change deniers. In fact, one of them recently said, "We don't have to worry about it because God will take care of it." It's unbelievable that this is happening in the richest, most powerful country in the world. That's one major area where there should be substantial change and improvements. If not, there's not going to be anything much more to talk about in a generation or two. Others include just reconstructing the economy here so that people get back to work, so that they can produce things that the country needs, so that they can live decent lives. All of that can be done. The resources are there, but the policies aren't. AMY GOODMAN: Noam, you know, when you look at the new Congress, I'm reading from The New Yorker, "Darrell Issa, a Republican representative from California, is one of the richest men in Congress. He made his money selling car alarms, which is interesting, because he has twice been accused of auto theft. He said he had a "colorful youth". Now, with the Republicans about to take control of the House, Issa is poised to become the chairman of the Oversight Committee. The post comes with wide-ranging subpoena powers, and Issa has already indicated how he plans to wield them. He is not, he assured a group of Pennsylvania Republicans over the summer, interested in digging around for the sort of information that might embarrass his fellow-zillionaires: 'I won't use it to have corporate America live in fear.' Instead, he wants to go where he sees the real malfeasance. He wants to investigate climate scientists. At the top of his list are the long-suffering researchers whose emails were hacked last year from the computer system of Britain's University of East Anglia. Though their work has been the subject of three separate 'Climategate' inquiries -- all of which found that allegations of data manipulation were unfounded -- Issa isn't satisfied. He said recently, 'We're going to want to have a do-over'"
NOAM CHOMSKY: Yes. That's part of the massive offensive -- basically a corporate offensive -- and they haven't been quite about it. The Chamber of Commerce -- the biggest business lobby -- American Petroleum Institute and others have said, quite publicly, that they are carrying out a massive "educational campaign" to convince the population that global warming isn't real. And it is having an effect. You can see it even in the way the media present it: you read, say, a New York Times discussion of climate change. They have to be objective -- present both sides -- so one side is 98% of qualified scientists and the other side is Issa and a couple of climate change skeptics. They are missing, if you'll notice, also a third side -- namely, a very substantial number of leading scientists who say that the consensus is nowhere near alarmist enough and in fact the situation is much worse. The United States has been dragging its feet on this for a long time, and it's now much worse. Just a couple of days ago, there was a report of an analysis of green technology production. It turns out China is in the lead, Germany is next, Spain is high up there, and the United States is one of the lowest. In fact, investment from the United States in green technology is higher in China -- I think twice as high in China -- than it is in the United States and Europe combined. These are real social pathologies, exacerbated by the latest election, but just one aspect of where policy is going totally in the wrong direction. There are significant alternatives, and if they're not pursued there could be real disaster. It might not be too far off. AMY GOODMAN: I'd like to switch gears for a minute, Noam Chomsky, and talk about the elections in Haiti that just took place. NOAM CHOMSKY: "Elections" you should put in quotation marks. If we had elections in the United States in which the Democratic and Republican parties were barred and their political leaders were exiled to South Africa and not allowed to return to the United States, you wouldn't consider them serious elections. But that's exactly what happened in Haiti. The major political parties barred -- as we know, the United States and France essentially invaded Haiti in 2004, kidnapped the president and sent him off to central Africa. His party is now banned. Most analysts assume that, as in the past, if he was allowed to run he would probably win the election. Former President Aristide is ,by all information available, the most popular political figure in Haiti. Not only is he not allowed to run -- by, essentially, the U.S.Ðbut he's not allowed to return. They've been trying to keep him out of the hemisphere. Sure, he can't go back to Haiti, but the U.S. has been trying to keep him out of the hemisphere all together. What's taken place is a kind of charade -- it's not nothing, you know, Haitians are trying to express themselves, and we should respect that. But the major choices they might have are barred by foreign power -- U.S. power and France, which is the second of the two historic torturers of Haiti. AMY GOODMAN: Honduras. Interestingly, in these cables that have come out through the WikiLeaks release is the U.S. diplomatic cable from 2008 that says exactly what they U.S. government would not say publicly, that the coup against Manuel Zelaya was outright illegal. Your response, Noam Chomsky? NOAM CHOMSKY: That's right. This is an analysis by the embassy in Honduras, Tegucigalpa, saying that they've done a careful analysis of the legal and constitutional backgrounds and conclude -- you can read their summary, which is in the conclusion -- that there is no doubt that the coup was illegal and unconstitutional. The government of Washington, as you point out, wouldn't say that. And in fact, after some dithering, Obama finally essentially recognized the legitimacy of the coup. He supported the election taking place under the coup regime, which most of Latin America and Europe refused to recognize at all. But the U.S. did. In fact, the U.S. ambassador publicly accused the Latin Americans who wouldn't go along as being 'seduced by magic realism', like Garcia Marquez's novels or something, just a statement of contempt. They should go along with us and support the military coup -- which is illegal and unconstitutional. And it has many effects. One of the effects that it preserves for the United States a major airbase -- the Palmerola Air Base, one of the last ones remaining in Latin America. They've been kicked out of all the others. AMY GOODMAN: I have two questions and we only have two minutes left. One is about North Korea. The WikiLeaks documents show Chinese diplomats saying that Chinese officials, "Increasingly doubt the usefulness of neighboring North Korea" and would support reunification. The significance of this? NOAM CHOMSKY: I'm very skeptical about that statement. There is no indication that China would be willing to have U.S. troops on its border, and that is the very likely outcome of a reunified Korea. But they've been bitterly objecting to U.S. naval maneuvers in the Yellow Sea, not far from their coast -- what they call their "Economic Territorial Waters". Expanding U.S. military forces near their borders is the last thing they want. They may feel -- I don't know -- that North Korea simply is nonviable, and it will have to collapse, and that's a terrible problem from many points of view, but that I don't know. But I'm pretty skeptical about that leak. AMY GOODMAN: Finally, Noam, your latest book Hopes and Prospects. What gives you hope? NOAM CHOMSKY: Well the Hopes part of that book is mostly about South America where there really have been significant, dramatic changes in the past decade. For the first time in 500 years, the South American countries have been moving towards integration, which is a prerequisite for independence, and have begun to face some of their really desperate internal problems. There is a huge disparity between islands of extreme wealth and massive poverty. A number of the countries -- including the leading one, Brazil -- has chipped away at that. Bolivia has been quite dramatic with the takeover by the indigenous population in a major democratic election. These are important facts. AMY GOODMAN: Noam Chomsky, thank you for being with us. Oh, and happy birthday.